Although you've previously seen a masculine card I made very, very similar to these, these are the cards we made for my Birthday Card Kit class using one of my very favorite Designer Series Paper - Brocade Background. I wish had more of this! 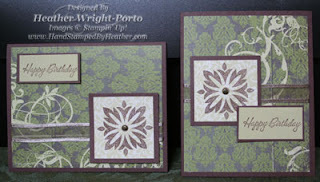 Another reason I love these cards and the Designer Series Paper is that they are so easy to make! Simply stamp in Chocolate Chip ink on the light green paper from the Designer Series Paper pack and River Rock (for the Happy Birthday greeting), then just assemble the layers of the card (with SNAIL adhesive and Dimensionals were desired). Remember to wrap the ribbon around the layered pieces before adhering to card front.